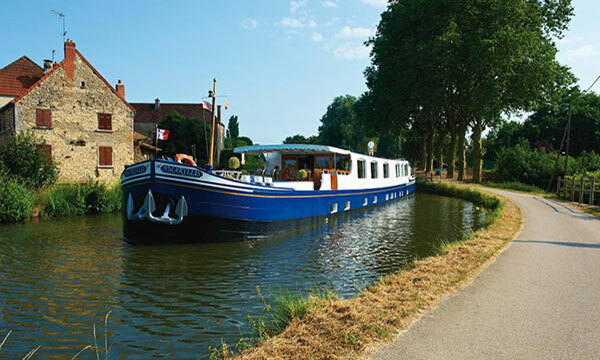 Discover Alsace-Lorraine’s enchanting cobbled villages, scenic vineyards, and gourmet cuisine while cruising France’s historical waterways on La Nouvelle Etoile. In fact, La Nouvelle Etoile boasts a long list of premium innovations, such as an elevator, exercise room, and laundry facilities. The spacious deck is the perfect place to linger a with glass of wine. When not relaxing in the hot tub, guests can explore their cruise region by walking or bicycling along the towpaths. In addition to the expected sights in the vibrant cities of Strasbourg and Nancy, Captain Jan offers compelling regional excursions, including a visit to a village where fine crystal is still blown by hand, a winetasting in the local vineyards, and a stop at a restored church with beautiful windows by Marc Chagall. Gourmands thrill to La Nouvelle Etoile’s extraordinary culinary experience, which features seasonal ingredients and regional specialties, served at a table replete with elegant Wedgewood china, Christofle silver, and the finest crystal. Wines are selected from both local vineyards and New World producers, reflecting La Nouvelle Etoile’s international roamings. Indeed, La Nouvelle Etoile is very unique in that Jan begins the cruising season in Holland during Tulip Time, and then makes the journey to France via the canals of Belgium. 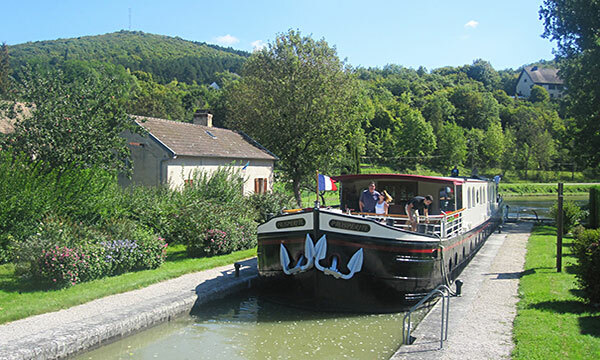 Captain Jan spends most of the season in France, traversing many cruising regions, and then completes in the season cruising to Germany and Luxembourg on the petite Mosel River. In the afternoon, you will be met by a crew member of La Nouvelle Etoile at the designated meeting point. From here, relax as you are chauffeured to the barge, moored in Nancy. A traditional welcome and introduction to the crew awaits you, before a short cocktail cruise to Laneuville and the first of many gourmet dinners onboard. A morning cruise offers the perfect opportunity to relax on deck with a cup of coffee or tea, or explore the towpath with a gentle pedal or leisurely stroll. This afternoon, your Tour Guide chauffeurs you to the birthplace of the Art Nouveau movement, Nancy. A riverfront city in northeastern France, Nancy is known for its late Baroque and Art Nouveau landmarks, some dating to its days as the former capital of the Duchy of Lorraine. Return to the barge for an evening of drinks and dinner. A morning cruise presents the perfect opportunity to relax on deck with a cup of coffee or tea, perhaps while lazing in the hot tub and watching the beautiful scenery slip by. Today's excursions begin with a visit to one of the local Cristalleries where craftsman still blow fine crystal by hand. Then, the exploration of artisan excellence continues in Sarrebourg, where Chapelle des Cordeliers boasts beautiful Marc Chagall windows. Return to the barge for cocktails and canapes. Chef is putting the final touches on tonight's delicious dinner. This morning's cruise climbs higher to the crest of the Vosges Mountains. After navigating two tunnels carved into the mountaintop, La Nouvelle Etoile approaches the Arzviller Barge Lift. Constructed in 1969, the Lift was designed for barges to easily cross the Vosges Mountains. Before the Lift, barges had to pass through a series 17 locks, a route that took a full day; now the journey takes just four minutes, and guests onboard have a front row ticket to the show. Once moored for the evening, cocktail hour precedes tonight's dinner. A morning cruise offers the perfect opportunity to laze on deck with a cup of coffee or tea, take a dip in the hot tub, or explore the towpath with a gentle pedal or leisurely stroll. This afternoon, your Tour Guide chauffeurs you along the Route du Vin d’Alsace to a winetasting at a local vineyard. Swirl, sip, and savor the crisp complexity of some of the best regional wines. Next, a stop at the old fortified town of Obernai reveals the 14th century ramparts that surround the city. Back onboard, Chef presents another gourmet dinner. This morning's final cruise is the perfect time to relax on deck, or traverse the towpath by bicycle or on foot. This afternoon's excursion is to the capital city of the Alsace-Lorraine region, Strasbourg, where a beautifully preserved city center beckons with Gothic churches and pedestrian-friendly streets. “Petite France”, the small area between the rivers, is home to some of Strasbourg's most charming and photogenic boulevards. Return to the barge late in the afternoon and freshen up for the farewell gala at the Captain's Dinner tonight.